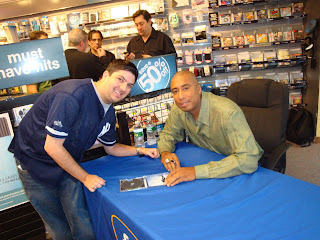 Here I am meeting Bernie Williams today at a mall in New Jersey. He was a great guy, I thanked him for all the great memories and he said no problem man and shook my hand. This was a great thrill for me as Bernie is a class act and of course a great Yankee. I am happy that Bernie is able to have a successful second career, not too many people can have 2 careers like he did and has. Bernie Williams walked out the back employees door as this event was held at FYE and the crowd erupted and started chanting Bernie. I can't imagine what a thrill it is to still get that kind of support but all of these guys that won the 4 world titles have that although I would say Bernie is near the top in the support of the fans if not at the top now that Mattingly has moved on. I got his autograph and CD and will enjoy that. I hope you guys enjoy the picture of me and Bernie. The Mets lost the last game of their homestand on Wednesday and started out on a 10 game 3 city daunting roadtrip. The Mets today won their 3rd straight in San Francisco beating the Giants 9-6. The Mets finally gave ace Johan Santana some runs to work with and David Wright continues to be hot for them. The Mets will have Mike Pelfrey face Matt Cain tomorrow going for the 4 game sweep Carlos Delgado was finally placed on the DL and it looks like he could be gone for a while maybe needing surgery. JJ Putz is pitching through is problem after getting a cortisone shot and hopefully won't have to miss any time. Tim Redding is scheduled to make his debut on Monday in LA. I am sorry for the lack of posts today but I was busy meeting Bernie Williams this morning and then got caught up in the Yankees game this afternoon. I will post a pic of me and Bernie later and talk about it a little. The Yankees had another great walk off win today, A-rod hit a 2 run walk off homerun. Mark Teixeira is looking good, he was 4-4 with 4 rbi's and a walk. I wonder if A-rod hitting behind him has anything to do with that hmmm?? Joba Chamberlain pitched 6 good innings, 2 runs on 3 hits. He is walking too many guys which raises the pitch count but he is getting better and better and he has a great era. The one thing about this team is I don't like how the offense is dormant for long stretches, I still think Kevin Long has to go. I do like how they come back though and never seem to give up. MO looked like the old MO today and Alfredo Aceves was sharp, I don't know why Joe continues to use Ramirez and Veras as I just think they are a waste and Melancon and Robertson would be much better and Phil Coke shouldn't pitch for as long as he did that is when he gets into trouble. The Yankees should be getting Bruney and Wang back this week and Posada in the next couple of weeks and Nady may even be back in 2 or 3 weeks and then that will really help them. A.J. Burnett starts tommorrow vs Kevin Slowey and really needs to have a strong start and get in the win column and then maybe someone will pie him. I think the Yankees can keep it going tomorrow. What a great come from behind win from the Yankees. I don't want to pour sour milk on this but the Yankees have to stop relying on the homerun hit a little with runners in scoring position. I will know be positive. Brett Gardner his last couple of games is getting it going which is great to see, its good to see him and Melky not pout or sulk when they weren't playing. They just kept working hard and when they get a chance they make the most out of it. Brett Gardner is so fast he can slip rounding the base and still get a standup triple. I love the inside the parker really got the fans fired up. A-rod had 4 walks, he hit the ball well yesterday and the day before had 3 walks so he seems to be getting there. I am happy Big Tex got a big hit in the ninth and showed some emotion there with Gomez. I hope his wrist is ok and also love Joe Girardi going after Gardenhire, I thought he was going to deck him. Johnny Damon getting thrown out showing some emotion was good also, the Yankees need to show more of this. This game hopefully was a game that can really bring them together and hopefully Yankee Stadium will continue to be a homefield advantage and the crowd will be like it was in the Old Stadium. Tonight was the first time they really got into a game and it was great to see. Phil Hughes pitched ok but not great and I am sure he will be back in AAA when Wang gets back next week at some point. I would think Hughes gets one more start on Wednesday since Wang is pitching on Sunday. Edwar Ramirez and Jose Veras pitched well in the eighth and ninth to give the Yankees a chance. Joba will pitch tomorrow and it will be interesting to see if he sends Carlos Gomez a message at all and if this gets worse over the next 3 games. Tonight- Phil Hughes vs Francisco Liriano Tomorrow- Joba Chamberlain vs Nick Blackburn Sunday-A.J. Burnett vs Kevin Slowey Monday- Andy Pettitte vs Glen Perkins Today is a big start for Phil Hughes, with Wang going Sunday if he pitches well Phil could be back in AAA next week. He needs to pitch a good game here and get the Yankees off to a good start on this long homestand. The Yankees need to win 3 of and although the pitchers are ok for Minnesota they don't have great era's this year. Liriano has a 5.75 era, Blackburn 4.32, Slowey 4.91 and Perkins 4.27 so these guys are hittable but we will see what happens. The Yankees defeated the Toronto Blue Jays tonight by the score of 3-2. I am not happy with the offense doing nothing against Brian Tallett but a win is a win. CC Sabathia pitched great again tonight throwing 8 innings of 2 run ball. He gave up 5 hits and 4 walks but also struck out 5. He was in control all night. Mo finished it off looking like the old MO 1-2-3 on 11 pitches with a strikeout to end the game. Hideki Matsui was the star of the game with the game winning homerun. A-rod had no hits but was robbed of a double and just missed 2 homeruns driving the ball to the warning track and the wall. Derek Jeter had a rbi single. Francisco Cervelli continued to be impressive with a couple of hits and a nice tag out at home plate off a Gardner throw. Johnny Damon had a double in the first inning to tie the Yankees team record for 10 consecutive games with a extra base hit. He tied Don Mattingly and Paul O-Neill who also did the same thing. Johnny will try to break the record tomorrow at home. The Yankees will now head home for a long 10 game homestand and the chance to play well and keep moving forward and get healthy. The Mets lost two of three against the Braves at home and now embark on a 3 city 10 game roadtrip against the Giants, Dodgers and Redsox. This could be a brutal trip for the Mets. It starts tonight against the Giants with John Maine vs Jonathan Sanchez. The Mets are also dealing with Carlos Delgado and JJ Putz having bone spurs and that will be worth watching as it is two key players. Jose Reyes once again yesterday in a tough loss made some boneheaded baserunning mistakes. This guy is a very very good player but has to stop being so immature and grow up. He cannot be so cocky and keep costing this team and that is the problem with the Mets they think they are better then they are but hopefully for them they will have a good trip. The Yankees have finally heard some of the fans complaints and relaxed their batting practice rules today. The fans can now go watch BP on the field level in the outfield and bleachers which is great news. The fans voices can be heard and were heard so lets keep it up if we have anymore complaints. There is a story that Josh Thomson of the Journal News did today on this highschool lefty whose name is Ryan Pennell. He struck out 21 in a seven inning game yesterday. He had to get 23 outs because two of the strikeouts got away from the catcher and the batter reached first base. He is 7-0 with a 0.29 era on the season. He has 112 strikeouts in 49 innings, I hope the Yankees are keeping their eyes on him. Jim Leyritz is in trouble again, apparently went to the hospital on suicide alert after trying to start his car but it wouldn't start because the device in his car that tests his breath showed that he didn't pass to be able to drive. The mighty has fallen with this guy, its really a sad situation. It doesn't look like this guy is going to learn and just needs to be locked up. Yankee Stadium will be gone soon so go to WCBS radio 880 and look at the pictures, this will be sad as it is slowly torn down. Andy Pettitte pitched six strong innings giving up 2 runs on 5 hits. He walked three hitters in the first inning but fought through it and then settled down. Brett Gardner hit his first major league homerun and also had a triple. Johnny Damon and Ramiro Pena also had triples making it the first time since April 5, 2003 the Yankees have had at least 3 players hit a triple in the same game when Raul Mondesi, Alfonso Soriano and Bernie Williams did it. Alfredo Aceves pitched 2 scoreless innings, the Yankees are looking for anyone out there to get outs so maybe he will pitch more as a middle guy for multiple innings. Brian Bruney threw today and will throw off a mound again on friday, he feels good and will be activated next week which should really help the bullpen. He also shaved his head today which is an interesting look. Mark Teixeira had a big night with a couple of hits and a sac fly, he had 2 rbi's, hopefully this will get him going in the right direction. A-rod had 3 walks as he continues to come back from hip surgery. Derek Jeter probably won't play until Friday and Matsui could have pinch hit tonight but we will see about tomorrow. Chien-Ming Wang will pitch one more game in Scranton on Sunday and if that goes well he should be activated and return to the majors. The Yankees had 8 extra base hits tonight, the most they have had in a game all season. CC Sabathia will go against Brian Tallett as they go for the series win and winning roadtrip, if they can get the win and come home 4-2 they will have some momentum as they come home for a 10 game homestand where they can do some damage. The Yankees were stymied by Doc Halladay as usual. He pitched a complete game giving up 1 run. A.J. Burnett didn't pitch too bad but had one bad inning where he gave up 3 runs, no help from the umpire and the third run was out at the plate but Kevin Cash couldn't hold on to the ball. The thing is this is a game where A.J. needed to just dominate Toronto and couldn't, the Yankees pitching has been a huge disappointment and the real reason why they are struggling. I know it is early but it isn't that early and if they don't get it together in the next couple of weeks they will miss the playoffs again and that will be very embarrassing. They have a new stadium which they already can't fill and it will only get worse unless the team starts playing the way they should. How can Mark Teixiera keep hitting under 200 and all of the injuries and guys like A.J. have a era north of 5, it just doesn't make sense but it is what it is. I really would hope the Yankees can win the next couple of games and then do some damage on the 10 game homestand and go into June with some momentum but we will see. Derek Jeter hopes to play tomorrow but says it isn't getting any better and he is hoping he doesn't need to miss a couple of weeks or so. Jorge Posada is getting closer to returning as well as Bruney who will throw off a mound tomorrow, if he is ok he may come back pretty much right away. It appears Wang will pitch another game in Scranton but nothing is official right now. He threw 6 shutout innings with 3 hits and 6 strikeouts, he says he feels good and can see the difference, his sinker is now staying down and his velocity is up which is great. I don't know but maybe getting Wang back will get them rolling with the pitching also and Bruney makes a huge difference with the bullpen. A-rod will get better and Tex I assume will eventually just go nuts and not stop hitting the ball. The problem for the Yankees is they can't overcome the injuries and have to hope the pitching gets it going and carries them, Pettitte and CC need to lead the way the next two games and get them big wins and hope it gets everyone else going. Roger Clemens was on the Mike and Mike show this morning on ESPN radio and continued to deny using PEDS. I wonder if this guy has lied so much that he believes his lies now?? I will get more into this later on but he still says Andy Pettitte misremembers their conversations and that there is no way Brian McNamee has his dna because he never gave him HGH or steroids, that is pretty funny Roger. The reason he broke his silence is because a book about him came out today. Johnny Damon was named the player of the week today, good for him. Damon is a free agent at the end of the year and right now the Yankees may have to think about bringing him back. They have Swisher, Austin Jackson maybe and Melky but I would doubt they would trust Jackson and Melky in the outfield. Damon could also play some DH as Hideki Matsui will be gone after this year. Roger Clemens will be on the Mike and Mike show on ESPN 1050 radio in NY tomorrow. They say that there is no limits so it should be interesting, I am sure they will ask if he still denies doing steroids, what he thinks of Andy Pettitte and his former trainer. What does he think of Manny and A-rod, everything is on the table and I doubt he will admit to doing it now after all these years. Johan Santana goes against Derek Lowe tonight in a premiere matchup. The Mets will be looking for their 8th straight win. Here is the lineup for tonights game: Reyes(SS) Castillo(2B) Beltran(CF) Wright(3B) Murphy(LF) Tatis(1B) Reed(RF) Santos(C) Santana(P) Carlos Delgado is out with his hip issue which seems like it will be an issue all year. He may not play to friday and their is a possibility of him going on the 15 day DL. Tomorrow- A.J. Burnett vs Roy Halladay- This is the marquee matchup of friends and student vs teacher. Wednesday- Andy Pettitte vs Scott Richmond Thursday- CC Sabathia vs Brian Tallett The Yankees would like to win two out of three here and maybe get the Blue Jays to start losing a little, time to make a move as the Red Sox have a tough schedule now the Yanks don't and Dustin Pedroia and Kevin Youkilis are hurt. AAA-Scranton- Austin Jackson continues to play well hitting 360 with a 430 obp. Shelly Duncan is on the DL with a sore shoulder but was batting 333 with 10 homeruns and 29 rbi. John Rodriguez is batting 302 with 6 homeruns and 25 rbi. Juan Miranda is batting 283 with 6 homruns and 24 rbi. Pitching- We have seen Phil Hughes come up after going 3-0 with a 1.86 era. Ian Kennedy before getting hurt was 1-0 with a 1.59 era. Zachary Kroenke is 3-0 with a 0.60 era, in 15 innings he has 9 strikeouts and walks. Brett Tomko was 1-0 with a 0.64 era as the closer and is now in the majors. Mark Melancon is 2-0 with a 0.75 era and was in the majors but now went back down. Dave Robertson also was in the majors and went back down, he is 0-2 with a 1.74 era. AA Trenton- Chris Malec is batting 375 with 0 homeruns and 6 rbi's. Jorge Vasquez is batting 308 with 5 homeruns and 19 rbi's. He has only played in 14 games. Colin Curtis is batting 297. Reegie Corona is batting 284. Pitching- Zach McAllister is 1-1 with a 2.67 era, George Kontos is 1-1 with a 2.66 era. Wilken De La Rosa just got promoted from A and is a guy to watch for- left handed. A-Tampa- Mitch Hilligoss is batting 326 with 0 homeruns and a rbi. Jesus Montero is batting 302 with 5 homeruns and 18 rbi's. Austin Romine is batting 295 with 2 homeruns and 12 rbi's. Pitching- Jeremy Bleich is 2-1 with 2.70 era, he has 22 strikeouts in 33 1/3 innings. This guy was drafted out of Stanford and reminds me of Tom Glavine, he could move quickly so keep your eye on him. Dellin Betances is 2-3 with a 3.90 era, he has 34 strikeouts in 32 1/3 innings but also 16 walks, he is one of the top prospects but is only 19 years old. Lance Pendleton is 2-2 with a 3.90 era, he has 23 walks in 32 1/3 innings. A- Charleston- David Adams is batting 302 with 14 rbi's. Pitching wise Manny Banuelos is 1-0 with a 3.18 era. Andrew Brackman is 0-4 with a 4.55 era. Pat Venditte is 2-1 with a 0.61 era. He is the ambidextrous pitcher. I know its a little past a month in but I want to go around baseball a little with some thoughts and observations. How in the world do the Yankees have the worst team era in baseball, that can't last can it Break up the KC Royals as they are in first place led by Zach Greinke and his era under 1 with a 6-1 record. This is the same guy who had some mental issues a couple of years ago. The Mets are hot winning 7 in a row, with that pitching staff its pretty amazing. The Toronto Blue Jays are playing great in first place in the AL East but haven't played the Sox, Yanks or Rays yet. They are doing it with Halladay leading them but the rest of the staff is pretty much unknowns. The Dodgers sure are a different team without Manny, they were the best team in baseball and since he got suspended have gone 1-3. The Yankees are a different team without A-rod also, a losing one and a winning one with him. I look at the Rays this year and just don't think they have the pitching to make it back to the postseason but they have the leagues rbi leader in Evan Longoria with 44 and the sb leader in Carl Crawford who I believe had 24 going into tonight. The Angels don't look anything like they have looked over the past few years, but they are devestated by injuries. Big Papi, where is the power??? I wonder why he isn't driving it, is it really the wrist injury or is there another reason?? Matt Holliday doesn't look like the same player out of Colorado, he better pick it up if he thinks he is going to cash in as a free agent next year. How good is Johan Santana?? The Mets don't score any runs for him either. The Yankees won the rubber match of the 3 game series with Baltimore thus winning the series 2 games to 1. They won today's game by a score of 5-3, once again Joba struggled in the first inning giving up a 3 run homerun to Aubrey Huff but was great after that throwing 5 more scoreless innings. Phil Coke came in to pitch the seventh and eighth giving up 0 runs and Mo slammed the door shut giving up a walk in the ninth but thats all. Johnny Damon was the star for the offense hitting a 3 run homerun to give them the lead that they didn't relinquish. Mark Teixeira had a solo homerun, A-rod a single. Francisco Cervelli had a infield hit and so did Derek Jeter setting up Johnny Damon's heroics. Robinson Cano had 2 hits and a rbi and Nick Swisher had a hit. The Yankees will now travel to Toronto for a 3 game set beginning Tuesday with A.J. Burnett vs Roy Halladay. They have tomorrow off which is good for them. Chien-Ming Wang will make a rehab start in Scranton on Tuesday scheduled to throw 100 pitches and if he does well could rejoin the team after that but we will see. The Mets will look for the sweep today with Livan Hernandez going against Ian Snell. The Mets are also looking for their seventh win in a row and they now sit in first place in the NL East. The game will be on WPIX ch 11 in NY, and here is the Mets lineup: Reyes(SS) Castillo(2B) Beltran(CF) Delgado(1B) Wright(3B) Murphy(LF) Santos(C) Church(RF) Hernandez(P) I haven't been doing this for the Mets and I plan on trying to do this everyday so for all you Mets fans I will do a better job with the Mets info. Ramon Castro strained his quad last night so we will see how long he will be out and for now Santos will have his chance.